Yesterday I was being interviewed by Larry Williams when I came out with 'benefit package'. We shouldn't talk about people being on a benefit - but a benefit package. That is because only a minority receive just the basic benefit. And if they do, it is because they have other means or fewer outgoings. This is not about attacking beneficiaries. 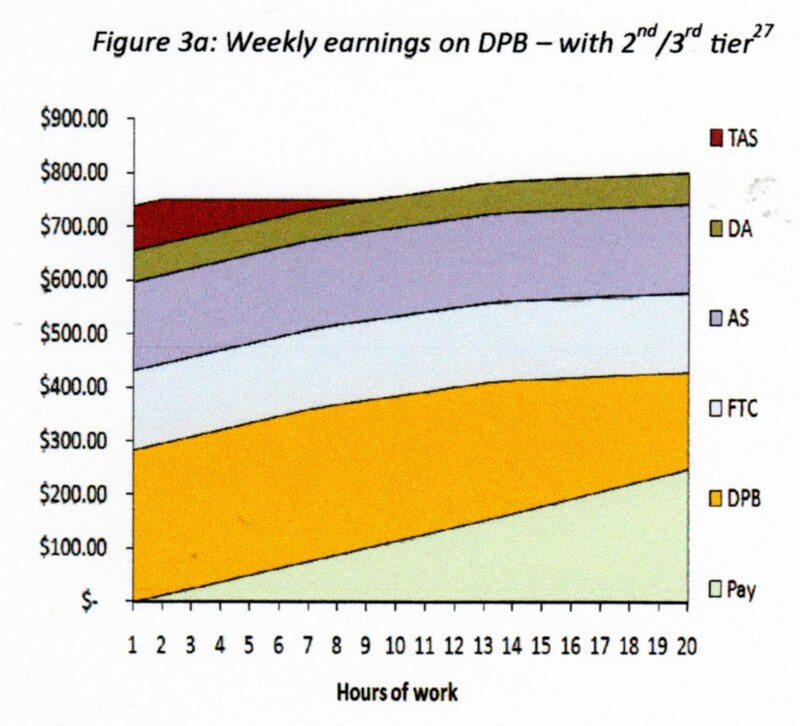 It's about properly understanding why some are reluctant to give up what they perceive as a/ an income comparable to what they would receive through working and b/ greater security than a job. There are other tables available for supplementary assistance for child or adult disability, special needs grants etc. Assistance that people who are not on benefits do not receive, unless they meet the means-tested requirements. I take you back to a comment made to Simon Collins of the NZ Herald earlier this year. 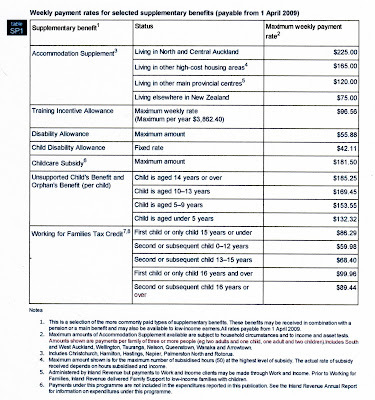 "The alternative group, chaired by Massey University social policy expert Mike O'Brien and including former Green MP Sue Bradford, says current benefits of $194 a week for a single adult or $366 for a sole parent with one child are "simply too low to live on"." The whole thrust of the Alternative Welfare Group's approach is to misrepresent the situation to garner public support for 'poverty-stricken' beneficiaries which then turns into political opposition to reform. No, it is not easy being on a benefit. It is not easy being on a low income full stop. Neither is it easy working 5,6 or 7 days a week only to lose a good part of your earnings to someone who refuses to make similar efforts. "... the alternative group says there is actually "no immediate crisis". It says beneficiaries fell from 15 per cent of the working-age population in 2000 to only 10 per cent in 2008 when jobs were available, and have risen to only 12 per cent in the current recession." 12.5 percent is a crisis when compared with the 30 years that followed the creation of social security when the total number of working age people receiving a benefit never exceeded 2 percent. Also ignored is that those making up the current 12.5 percent are on typically much longer term benefits than the dole which made up half of all benefit uptake in the early 90s. It says the $60 a week "in-work tax credit" for families with at least one fulltime worker should be paid to all low-income families. This claim has been made ad nauseam. The Child Poverty Action Group took their case to the Human Rights Tribunal and lost. The Tribunal found the government had the right to discriminate in order to encourage people to work. And remember it was a Labour government they were fighting. There is no way any of the stuff in this report is going to fly. It merely serves to remind us of the type of sentiment that got us into such a mess with welfare. The Alternative Working Welfare Group presents its final report today. 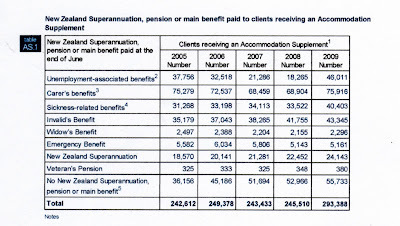 I can't find an associated media release but just heard Sue Bradford on the radio network news talking about recommending raising benefit levels, 'full' living wages, recognition of caring and the inclusion of beneficiary wants for the system. They have an event planned in Wellington today. Fortunately, as it stands, they have no political power to implement their desire for ever more wealth redistribution. Still sketching every day in Eastbourne. Painting sales leave a lot to be desired but the pastel commissions are steady. Here's one picked up yesterday by the delighted owner of an English Setter. “We now have 342,076 people on benefits - that’s ten percent of the working age population – we’ve a long way to go to improve this picture,” says Ms Bennett. Yet in September the Ministry benefit fact sheets showed that between 12 and 13 percent of the working age population was reliant on a benefit. So the Minister is saying that 1 in 10 working-age people is on a benefit but the Ministry is saying 1 in 8. 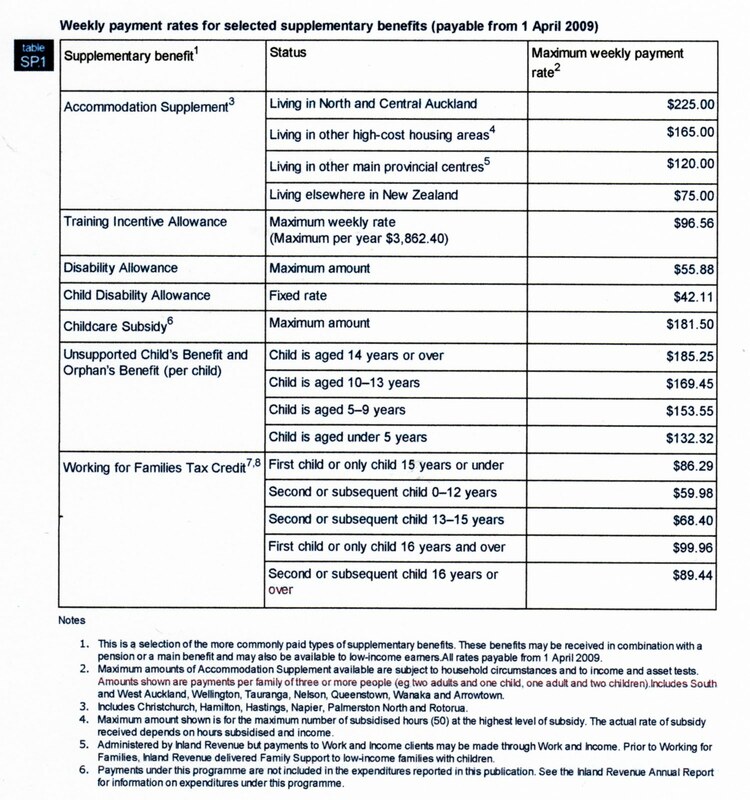 This fact sheet defines the working-age population as aged 18–64 years to reflect the minimum age of entitlement to most benefits and the age of eligibility for New Zealand Superannuation. 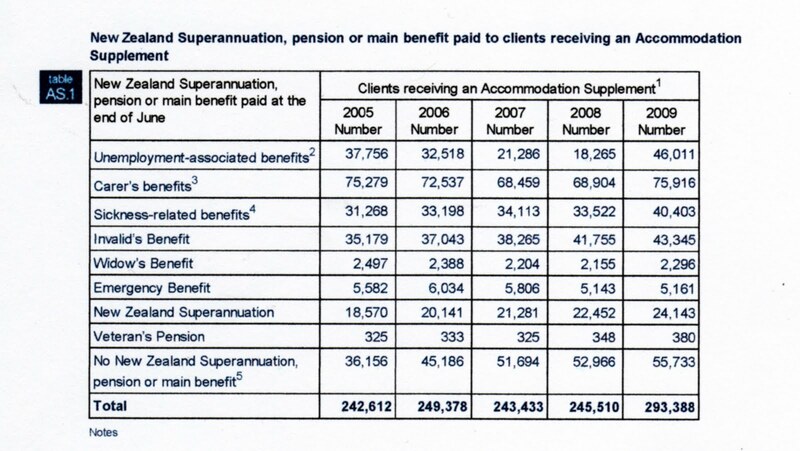 All information in this fact sheet refers to working-age recipients of main benefits. I note too that the increase in absolute numbers is being largely blamed on students going on benefits. As usual with universities finishing for summer, an influx of students (5,802) going onto benefits pushed overall benefit numbers up....The biggest contributor to the rise in overall benefits in November was due to the influx of students onto benefits. "It's really pleasing to see 5,595 young people came off a benefit in just the last month," says Ms Bennett. "Young people have been among the hardest hit by the recession and initiatives like Job Ops and Community Max have proven vital in keeping young New Zealanders in work," says Ms Bennett. 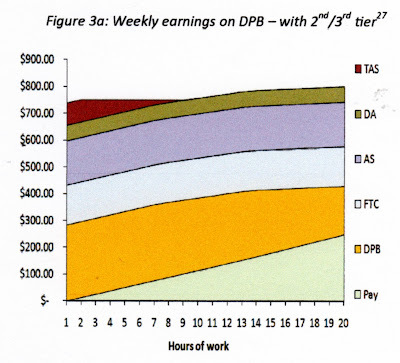 In reality all that happens is students move between student allowance and the unemployment benefit. Tapu Misa's latest column is a criticism of the Welfare Working Group's focus on paid work to reduce dependency on the state. She "whines" (her word) that stay at home mums feel worthless and undervalued. She presumes to speak for all at home mums. Collectivists have to do that in order to find collectivist solutions. Personally I never, ever felt undervalued as an at-home mother but what I and my family think is more important to me than the views of any other faceless community. But the picture Misa concocts is of a society increasingly ganging up on all stay at home parents. These days the idea of staying at home to look after young children seems increasingly old-fashioned and indulgent. Yet, strangely, more and more men are doing it. Any 'indulgence' arises from the fact that many parents are using public money to stay home. Not money their partner has earned. But Misa never makes any distinction between the two. Some mothers (I imagine most) work because of economic necessity, but I've had more than a few women confess to me that they needed to work for their own sanity. The mothers I know who are resisting that trend, despite the personal and economic costs, find themselves swimming against a tide that is increasingly unsympathetic, even dismissive of the role they play in raising and supporting their children. There it is again. A 'tide' of collective opinion. This leads to the predictable assertion that society puts no value on 'caring', or not enough anyway. What she really means is that the state puts no value on caring because she observes the state getting increasingly reluctant to pay for it. That is because when the state takes on responsibility for the upkeep of individuals they do less and less for themselves and each other. Families have fewer reasons to stay together and rely on one another. I am sure that the members of the WWG do value individuals caring for one another but understand that the welfare system has undermined this. With its narrow focus on paid work rather than care, it continues to miss the bigger picture. No. I think it is Tapu Misa who misses the big picture. As the New York Times reported last week, budget cuts in schools, for example, have heightened the need for more volunteer help just as parents have less and less time to give. The unpaid work that would have been done by stay-at-home mothers is now falling on over-burdened working mothers, who are starting to "say NO to volunteering". High unemployment has meant more people have more time on their hands. People are stepping forward to fill roles in schools that were previously paid positions and perversely, the unions are fighting them. Out of necessity the state is shrinking and the left do not like it.